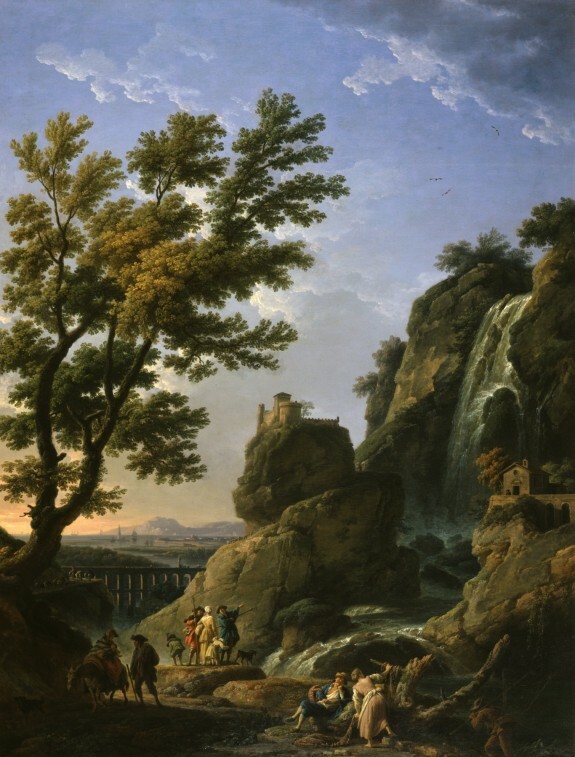 Description At the age of twenty Vernet left his native Avignon for a lengthy stay in Rome where he devloped a style of idealized landscape painting derived from the 17th-century classical traditions of Claude Lorrain and Salvator Rosa. Not until 1762 did he settle in Paris, metting with success there painting marine scenes and "picturesque" views that recalled his Italian sojourn as well as reflected a debt to Dutch landscape painting. His work was admired by wide international clientele. Scenes with cascades of waterfalls loosely based on the famous Italian sites of Tivoli and Terni were painted by Vernet throughout his career, and several are recorded for the year 1768. This handsome painting was commissioned for an 18th-century country house located in Danson Park, England, that was designed by the architect Robert Taylor for the English merchant John Boyd in 1766. Vernet was the leading landscape painter of the 18th century. His idealized compositions, loosely inspired by the Italian countryside, were much prized as souvenirs of the so-called "Grand Tour" of Italy made by the elite to acquire cultural sophistication. In this landscape, Vernet evokes the feel of the Italian countryside, which he has adorned with picturesque ruins and lively figures, without actually re-creating any specific time or place. This work combines all the typical elements of Vernet's ideal views. As tourists gawk at the waterfall, picturesque peasants go about their business. The perfectly calculated balance between the large tree, the harsh rocky face of the cliff, and the sun-drenched vista beyond the aqueduct evokes the notion of the sublime which figured so prominently into the 18th century. Landscape Painting. Wadsworth Atheneum Museum of Art, Hartford. 1931. Maryland Heritage: European Art at the Time of the Revolution. The Walters Art Gallery, Baltimore. 1976. Provenance John Boyd (1718-1800), Danson, December 1766, by commission; The Ehrich Galleries, New York, 1929-31; Juliet Anne Scott Pierson [d. 1964], Greenwich, CT [date and mode of acquisition unknown]; Victor Sparks, New York [date and mode of acquisition unknown]; Walters Art Museum, 1964, by purchase.